Updated May 22, 2018, at 7:50 p.m. EST: The Office of Population Affairs just released the full text of a proposed rule which would strip organizations like Planned Parenthood of federal family planning funding under Title X if they refer patients for abortion. The Trump administration just proposed a new policy barring medical facilities that perform abortions from receiving federal funding for family planning services, The New York Times reported. In addition, this proposed rule, which was announced on Tuesday, May 22, would eliminate the guarantee of receiving accurate health information about pregnancy options. This is a clear and deliberate attack on Planned Parenthood, which currently receives federal funding to carry out their non-abortion services, and is one of the largest providers of affordable health care in the country. What would the policy do? To start with, it would put the lives of the 4 million people in the United States who rely on health care from providers funded by Title X at risk by limiting their access to basic services like cancer screenings, birth control and health checkups. This would happen if the federal funding health centers like Planned Parenthood received was cut because they also provide abortion services or even just referrals. The proposed rule would also bring us back to a 1988 Reagan administration policy, which dictates that clinics that provide abortions must have a “physical separation” as well as “separate personnel” from their other family planning services, according to The New York Times. It is also sometimes referred to as a “gag rule” because it also prevents medical professionals who work at facilities that receive federal family planning funding from giving accurate information about abortion or where they could obtain one. But the proposed rule goes one step beyond the Reagan-era policy and strips the patients’ right to get information on abortion as a safe and legal medical option, Kashif Syed, senior policy analyst for Planned Parenthood Federation of America, said on the same press call. And for clarification, neither Planned Parenthood nor any of the other federally funded clinics currently receives federal funding for abortions. The money they receive from the government is used exclusively for providing services like health screenings and birth control. When will this rule go into effect & what can we do to stop it? As of right now, we’re still waiting for the Trump administration to officially release the proposed rule, but, according to Syed, it has already been submitted to the Office of Budget and Management. He explained that the whole process usually takes between three and six months or longer. It starts with the notice of the proposed rulemaking and is followed by soliciting public comments for 30 to 60 days before the final rule is issued, he clarified. So right now, we’re right at the beginning of the rulemaking process. 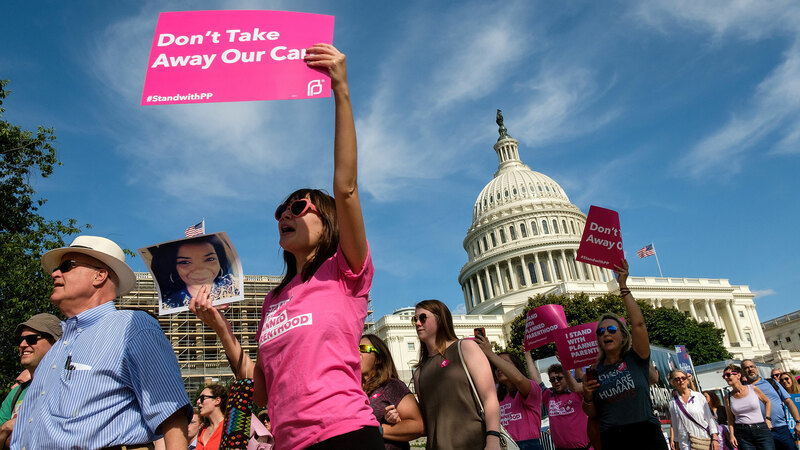 Planned Parenthood urges its supporters to sign a petition against the proposed rule or to plan a flash action requesting that your representative oppose the gag rule. Given that this isn’t the Trump administration’s first attempt to defund the organization and others who receive Title X funding and provide a full range of medical services, including abortion, there will likely be pushback against the proposed policy.